Just because it’s a water bottle doesn’t mean it has to be boring. This durable, BPA-free bottle features contemporary design and shatter, stain and odor resistant construction. Water bottles are popular because they have a long, productive usage life that promotes your business or message for a very low cost per impression. Use for office wellness programs, a conservation campaign, or package up with a tshirt inside as part of a health club welcome package. 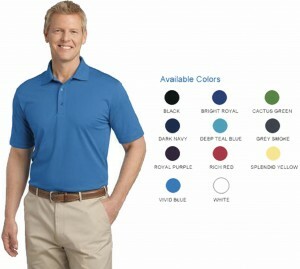 Polos are a popular corporate apparel item because they work for nearly any purpose. This versatile polo is a great compromise between style, features and affordability. Moisture wicking 100% polyester fabric provides lightweight comfort for retail employees or tradeshow exhibitors. This 85% recycled cotton tote has tons of potential for dialy, repeated use, and its perceived value is much higher than its actual price. While supplies last! Great as a trade show handout or an event swag bag for your guests. Any time you choose a promotional product with a well-known brand name like Duracell, you add value and impact. This flash drive features a sliding mechanism and includes a gift box. USBs are a great way to share content with your clients, and are always favored by tech-savvy recipients. The key to selecting effective promotional products – even the ones that are proven successes like these – are to make sure they reflect the message you are trying to convey. Talk to us about your next project and we’ll make sure to find the items that will get the results you want.